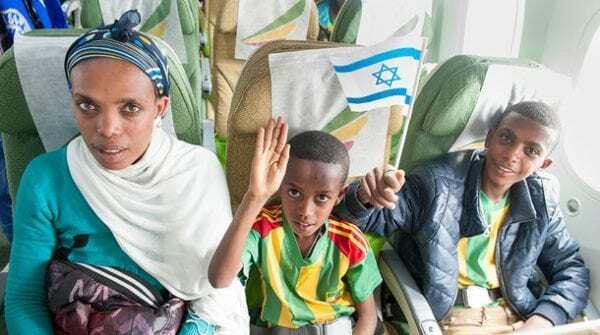 Around 450 new immigrants from Ethiopia boarded two Jewish Agency-chartered flights bound for Israel yesterday and arrived in Tel Aviv a few hours later. Since 2010, thousands of Ethiopians have immigrated to Israel as part of Operation Dove’s Wings. Today’s flights bring this historic effort to a dramatic close. Upon the flights’ arrival at Ben Gurion Airport, there was a welcome ceremony with family members and partner organizations. Earlier this morning, A farewell ceremony for the 450 olim (new immigrants) was held at the Israeli Embassy in Addis Ababa, with Jewish Agency Chairman Natan Sharansky Israel’s Minister of Immigrant Absorption Sofa Landver, and Israel’s Ambassador to Ethiopia Belaynesh Zevadia. Shortly thereafter, the two chartered flights organized by The Jewish Agency flew to Ben Gurion Airport in Israel for a welcome ceremony with Agency representatives, the Absorption Ministry, the Jewish Federations of North America (JFNA), the International Fellowship of Christians and Jews (IFCJ), Keren Hayesod-United Israel Appeal, as well as other donors and supporters. The new immigrants’ relatives were on hand to greet them as were The Jewish Agency partners in Completing the Journey of Operation Dove’s Wings, Israel’s Ministry of Immigrant Absorption, The Jewish Federations of North America (JFNA), the International Fellowship of Christians and Jews (IFCJ), and Keren Hayesod – United Israel Appeal (KH-UIA), among others. Speakers at the airport welcoming ceremony on August 28th will include: Jewish Agency Chairman Natan Sharansky, Sofa Landver, Minister of Immigrant Absorption, Housing Minister Uri Ariel, IFCJ President Rabbi Yechiel Eckstein, KH-UIA Chairman Eliezer (Mody) Zandberg, as well as KH-UIA member Airtom Clerman and JFNA member Danny Labin, among others. Operation Dove’s Wings began in November 2010 with the Government of Israel (GOI)’s decision to bring 8,000 Falash Mura in Gondar to Israel. The GOI tapped The Jewish Agency to prepare those eligible for entry to Israel and to facilitate their Aliyah in concert with immigration eligibility standards regulated by Israel’s Ministry of the Interior and in preparation for their resettlement in Israel by the Ministry of Absorption. Since Dove’s Wings’ inception, The Jewish Agency brought 7,000 Ethiopian Jews to Israel, the majority of whom are members of the Falash Mura community, and several hundred of whom were eligible for Aliyah through Israel’s Law of Return. To prepare these olim (immigrants) for a successful life in Israel, The Jewish Agency for Israel has run a community center in Gondar, Ethiopia for the past three years and with the support of IFCJ and JFNA. This center has provided a wide range of educational and social services. Upon their repatriation in Israel, The Jewish Agency housed these new immigrants in 17 absorption centers throughout the country that are run by The Agency and Israel’s Absorption Ministry. Jewish Agency Chairman Sharansky shared, “The Jewish community of Ethiopia is one of the oldest in the world, with roots reaching back to the times of King Solomon and Queen Sheba. For thousands of years this community has been yearning for Zion. By completing the Journey of Operation Dove’s Wings, we close the circle on a journey that began three thousand years ago.” Sharansky also thanked The Agency’s partners for their support in bringing these new immigrants home to Israel and in facilitating their absorption into Israeli society, a group effort that began in 1948 and which has, to date, has brought 92,000 Ethiopians Jews to Israel. Sharansky added that The Jewish Agency will continue to help all those who are eligible for Aliyah, per Israel’s Ministry of Interior, to move to Israel, as The Agency does for Jews the world over. Federal President of UIA Australia Harold Finger said: “With the final flight having arrived in Israel, KH-UIA is proud to have helped the countless refugees who began their journey in Ethiopia. From the very first air lifts authorised from the then Prime Minister Shimon Peres in 1984 through Operation Moses, Israel has air lifted thousands of Jewish Ethiopian refugees. They never lost the dream of returning to their ancestral homeland. I and many others who have been on KH/ UIA missions have had the honour of witnessing their first steps on Israeli soil, landing at Ben Gurion Airport. We shared that special moment with tears of emotion and felt enormous pride that we had played some part in fulfilling their dreams. 50 volunteers went from Israel to Gondar to prepare then new olim. The Jewish Agency is funded by the United Israel Appeal. Have there not been many Russian immigrants, whose Jewish roots were questionable?! The 12,000 Falash Mura who practiced Judaism with such enthusiasm – deemed not Jewish enough. A sad contrast.